Everyone has at one point experienced being lost or frustrated in a complex hospital, mall or airport. You are probably unaware of how big or far this gallery goes! 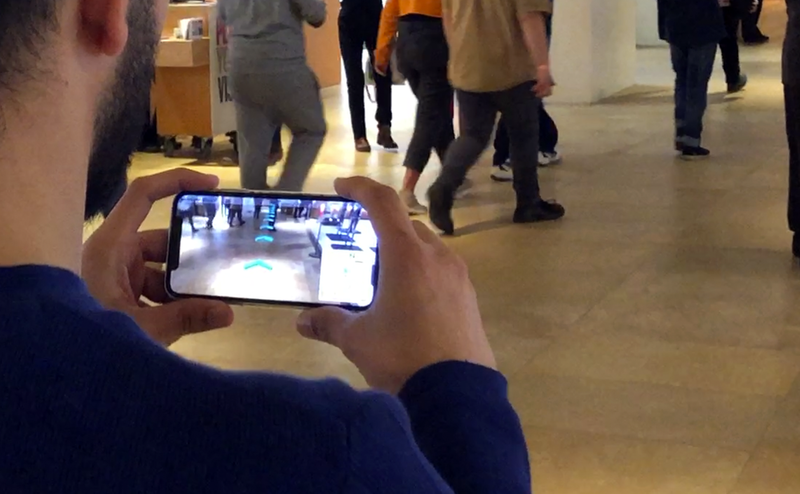 “MRsive” is an MR / AR (Mixed Reality/Augmented Reality) activated solution that supports indoor wayfinding and visitor engagement within complex architectural spaces, in particular the Art Gallery of Ontario. MRsive provides in-situ dynamic directions and information about the gallery space and the artworks. The AGO visitor intuitively follows virtual cues anchored in 3D in the physical space to find different exhibits or points of interest. MRsive augments the displayed art with extra digital information and engages the visitor with a multisensory interpretation of the art through visual, auditory and haptic interactions. Jad Rabbaa is a multidisciplinary digital designer with 10 years of professional experience. He combines his User Interface and User Experience skills with his passion for technology and virtuality. Over the past decade, he has worked for a wide array of clients around the world, ranging from TV channels to the public sector and the United Nations. Jad’s exposure to different fields keeps expanding, spanning over three continents, and five languages. Jad’s current research focuses on the use of state-of-the-art Augmented Reality (AR) to explore novel AR interfaces, user experiences and design for the future.